Roberto Pla is the indisputable guv’nor of Latin Music in the UK. Born in Barranquilla, Colombia, Roberto studied music at the National University of Bogota, going on to tour Latin America and the States with Orquesta Lucho Bermudez, Colombia’s leading big band. 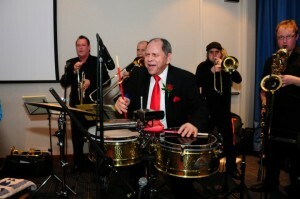 After session work in New York, he moved to London and co-founded the UK’s first salsa band, Valdez. Orquesta La Tradicion, Cayenne, Gonzalez, Sonido de Londres Joe Strummer, Arrow, Radio Futura, The Frank Chickens, Motorhead, Trevor Watts, Slim Gaillard, Alfredo Rodriguez, Kate Bush, M. People, Carlos ‘Patato’ Valdez, Adalberto Santiago, Azuquita, Tito Allen, the Nuyorican Poets, and countless others. In 1987, Roberto founded his own all-star band, the Roberto Pla Latin Ensemble. After a quarter of a century of globe-trotting and international residencies, this incredible, barn-storming dance band is still raising the roof at clubs and festivals, led by the legendary maestro himself on timbales: Roberto Pla.